In early September students enrolled in the Bachelor’s course in Art and Multimedia offered by LMU’s Institute for Art Education, and Master’s students in the Working Group on Media Informatics, will be on the road. Their goal is Linz, the Upper Austrian city which will host this year’s Ars Electronica. The students from Munich will be among the many artists who will be exhibiting their works at the now well established Festival, which focuses on the nexus between art, technology and society. This year’s show takes place on September 7-11. 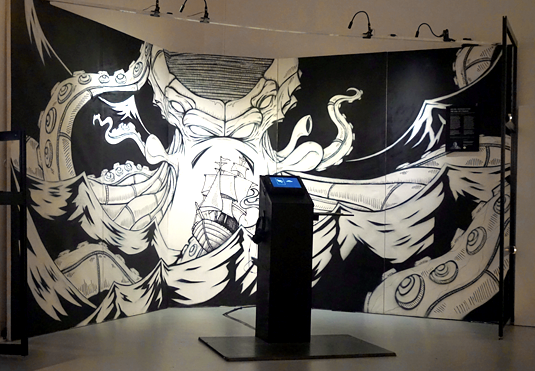 Michel Hohendanner's version of "The Call of Cthulhu" can be seen at the Ars Electronica. The picture gallery show extracts from his digital comic. The horror stories written by H.P. Lovecraft (1890-1937) are dominated by a spine-chilling atmosphere and an all-pervading feeling of dread. Michel Hohendanner, who is studying Art and Multimedia at LMU, has used Lovecraft’s most famous story, “The Call of Cthulhu”, as the basis for an experimental, digital comic, which will be shown at the Ars Electronica in Linz. “The Festival provides me with a unique opportunity to reach a large and interested public and to persuade conservative fans of the traditional comic genre that the digital treatment of a famous story can also add something to the original,” says Michel. “The animated elements in my version shift the emphasis of the story, as the reader can decide what he wants to see at any point in the narrative. Then there is the music, which draws the reader inexorably into the story.” The visual style of the storytelling, together with the eerie and mysterious music, intensifies the sinister and uncanny mood of Lovecraft’s masterpiece. COMB is a shape-based interface for musical interactions.